What you were doing or you are doing at 15? Probably addicted to social media or chilling your life. There are some boys who are running after girls and some are ruining their life with harmful addiction. And there is a 5 feet 8 inch tall boy from Dhangadhi, who is working day-night to avail his dream. Determinant teenager from far-western region of Nepal has already got the path-way which he should follow to achieve something applaudable in his life. As a cricket loving lad, he had already been part of his nation’s one of biggest T20’s league, Dhangadhi Premier League (DPL). Yes, he is none other than ‘Narayan Joshi’, part of Mahendranagar United’s DPL2’s squad and captain of Province no.7’s U-16 cricket team. It was 21st February, the day when players’ auction of DPL2 took place. 192 players were under the hammer. It was exactly 9:13 a.m. when anchor spoke out the name of ‘Narayan Joshi’. The sound immediately fasten the heartbeat of 15 year-old teen sensational, Joshi, who was witnessing it live on television back home. He stood on his feet and started to pray. United took some time before rising the placard to bid for Narayan Joshi at his base price (Rs25000). Joshi jumped on the air jubilantly. Then, he climbed upstairs to notify his mother, who was equally excited for this grand occasion. For rest of the world, it was just completion of a player’s auction but for a young dreaming boy, who dreamed to represent his nation, it was sweeter than sugar and cooler than ice. It took out Mountain’s weight’s burden off him. It was just more than a month for DPL to kick-off. There wasn’t even a single day when he hadn’t think and planned about his performance in DPL’s camp. He was willing to be part of Paras Khadka’s side but equally satisfied to play along with his own area’s deputy, Bhuwan Karki. He trained around 15 days in nearby academy under Bhuwan Karki. Karki suggested him to work on his hitting ability. He had no any variation in his bowling which is very essential component in T20 format so he added slower ball and yorker in his bowling’s syllabus. Then, he travelled to Mahendranagar to unit with his teammates and started to train with them. Binod Das was the coach of Mahendranagar United, with whom Joshi had already worked in Nepal U16 cricket team. So, Das was already well familiar with Joshi’s strength and weakness. Hence, Das quickly helped him to learn pace mix-up and yorkers. Das taught him several tricks to escape from big shot during death over. And obviously Das was also concerned about his hitting ability too. According to him, every senior player was very supportive and down-to-earth. He got to learn a lot from overseas players as well. All the seniors used to have suggestion for him in every move. 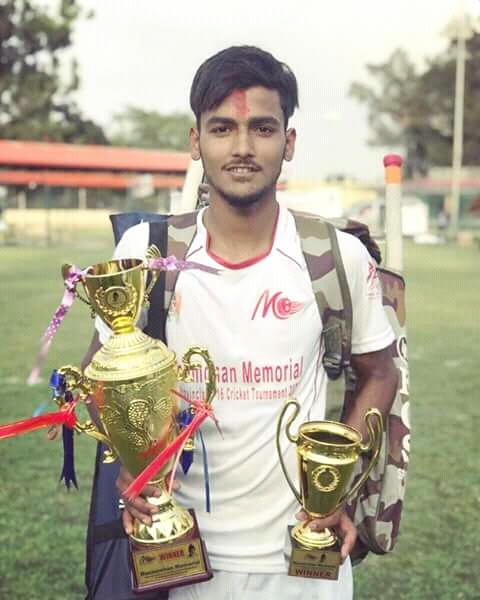 He got to play a match against CYC Attariya but unfortunately didn’t get chance to showcase his talent as he was unused in either of batting or bowling. But it was great and productive couple of weeks for 15 year-old lad. Besides all the players, his father was great inspiration for him, who used to phone him daily and remained him what he had achieved and always push him to do his best. With an ambition of addressing more about his DPL’s camp, we arranged a short interview with a boy himself. Who is the most motivating player of Mahendranagar United? What sort of motivation he used to deliver you? He always pushed me to work hard. He used to keep me with him and treat me like his own brother. He used to ask me to learn as much as possible during this camp. Did you address any of your weakness? Yes, I did. Training on such high level had exposed mine several weakness. I was very blank about death bowling trick and I was feeling hard to smash spinner during net sessions. How will you tackle it now? I had played lot of spin bowling during DPL’s camp. Now I have started working on it as well. “Practice makes a man perfect” so I will keep on practicing it. Regarding death bowling, I have learnt slower balls and yorkers trick so I need to practice it regularly to deliver it as per my desire. What’s your most memorable moment of DPL2? Before a clash against Attariya, Binod sir came to me and said to me that today you’re playing so get ready. It was such a surprising and memorable moment for me , I felt like that was the day I was born for. What’s the biggest positive that you withdraw from DPL2? I withdrew lots of positive from this dream camp. Biggest positive was I learnt to stay focus. Being in same change room with many seniors, I learned how to prepare mentally before entering the ground. Before I used to enjoy my strength in nets now I get the hunger to work on my weakness. What’s your funniest moment of DPL2? I’m not good at swimming so once I went to swimming camp with teammates. They were sprinkling water at me then I slipped out of the swimming tube, which I was using. I was nearly sunk in the pool. That for me was the moment of laughter. Who’s the funniest guy in Mahendranagar United’s camp? Hmm (With rise smile in his voice) Arun Airee. Are you satisfied with your performance in recently concluded U16 Inter-Province Cricket Tournament? No, I’m not. Being senior most player and captain of the side I should have taken the responsibility but I personally failed to do it. Teammates were expecting high from me but I failed to do it. What kind of message would you like to deliver to your fans that are following from your beginning phase? First of all I would like to thank them and request them to keep supporting me. Moving on I will rectify all the errors and try to take out best out of me. My first and all ambition is to be on national side. And I will give my everything to achieve it very soon. How will Joshi travel a tough-route coming on his way? I will train hard and try to be sensible in every move. I will take everything step by step and will give my heart out to make my parents and nation proud. This determined and humble guy will make us and his parents proud for sure. He is one of perfect example for those boys of his age, who are running after aimless objectives in life. Chase you dreams like he is doing. And besides his success, with him and bunch of young cricket passionate lads, Nepal cricket will touch more prosperity for sure.